In which a recruit’s name is plugged into Google and the bits of information that trickle out–guru ratings, newspaper profiles, YouTube highlights, all that stuff–are synthesized in the hopes of getting a clearer picture of the player we’ll see at Auburn next fall. Previously: Jessel Curry, Craig Sanders, Roszell Gayden, Brandon Mosley, Demetruce McNeal, Jake Holland, Shaun Kitchens, Cody Parkey, Cameron Newton, Joel Bonomolo, LaDarius Owens, Antonio Goodwin, Kenneth Carter, Ryan White, Dakota Mosley, Trovon Reed, Ryan Smith, Chad Slade, Ladarious Phillips, Jawara White, Steven Clark, Jonathon Mincy, Jeffrey Whitaker, and Corey Lemonier. Not that this has anything to do with Davis, but: seriously, Woodlawn should change their nickname to "Black Colonels," like, yesterday. Davis committed to Auburn last December as one of–if not the–most sleeperrific recruits of the Tigers’ class of 2010. When he committed, Rivals still hadn’t even evaluated him, and while that’s not unheard of the summer before, when we’re talking about 6 weeks before Signing Day it’s a sign a recruit is seriously under the radar. But like a lot of those sleeper recruits, the reaction from Auburn’s fanbase to Davis went pretty quickly from “Who?” to “OUR COACHES ARE TEH SMARTEST.” And not without reason, as you’ll see below. HIGH SCHOOL: Named to the 2009 5A All-State Football Team by the Alabama Sports Writers Association … Selected as the North and East Area Player of the Year and an All-Metro Team selection by the Birmingham News … No. 6 on the Birmingham News’ list of the Alabama Super Seniors … As a senior, had 1,621 all-purpose yards, including 134 carries for 877 yards (6.5 ypc), eight catches for 185 yards, 472 kickoff return yards and 48 punt return yards … Defensively, had 23 tackles (19 solo) and three pass break-ups while playing part time … Scored 60 of his team’s 109 points in 2009 … Also excels in basketball. 1. This will be a theme, but as you can see by the Area POTY honors and first-team status in 5A, the sportswriters and coaches who’d seen Davis play first-hand had plenty of respect for him. 2. Woodlawn’s traditionally a hoops school; unlike a lot of the players who dabble in basketball in the offseason for “meh” programs, for Davis to be a key player at a school like Woodlawn is a ringing endorsement for his agility and athleticism. RECRUITNIK HOO-HA: Despite the fact that no one knew Davis was when he committed, once the gurus took a decent look at him, they weren’t totally dismissive of what they saw. Well, Rivals kind of was: they gave him three stars, a below-average grade of 5.5, and didn’t list him in their athlete rankings. Davis is a multi-faceted athlete that has the versatility to line up on either side of the football and on special teams. He has decent size but could afford to put on some overall bulk and strength. Possesses both speed and agility. As a spread quarterback displays excellent running ability. Follows blockers and makes sharp cuts in the openfield slipping by defenders and making them miss. Shows acceleration and a burst to dash by would-be tacklers … Can be used as a runner on the reverse or counter using his speed to bounce the ball to the outside. A gifted and talented return specialist that fields the football and darts north and south often jetting by the coverage units; makes sharp cuts without losing speed. Shows the talent to take the ball back the distance for six points. Davis is a very versatile athlete that has the ability to play receiver, running back and returner at the next level. Could possibly be a man to man corner on defense. A multi-faceted athlete, Chris Davis does a lot of things for his Woodlawn team, but no matter where he is, it doesn’t take long for him to show off his athleticism. He has an outstanding change of direction, coupled with breakaway speed. He’s compact and strong and can break tackles as a receiver or jam his man as a defensive back. His athleticism makes him a potential receiver, defensive back, and kick returner. Word. Despite those skills, Davis didn’t wind up with much of an offer sheet: South Carolina was the only other SEC team to offer, UAB and Southern Miss the only mid-major programs of note to show interest. But there’s reasons for both that and the lack of love shown by the gurus. Davis didn’t have the funds to hit the summer camp circuit; he played for a low-profile, basketball-first school in a neglected part of metro Birmingham; by the time any major schools started showing interest, his season was over. There was no way for anyone to evaluate him until–thanks in large part to Phillip Lolley’s state high school connections, I’m guessing–Auburn had locked him up. So no, there’s not much in Davis’s guru ratings or offers to expect an SEC-caliber player … but I would take all of those with a healthy dose of salt, I’m saying. Insert “has he talked to Barbee?” joke here. Seriously, the shooting’s not going to help us, but that first step sure will. Oh, and I’m pretty sure this is also from early in Davis’s career, when he was still at Hayes High School, before it closed. Woodlawn assistant bas­ketball coach Juwan How­ard had the pleasure of see­ing David Palmer play football when the two were in school at Jackson-Olin. He experienced twice the pleasure of seeing the Colo­nels’ Chris Davis, who turned in exceptional per­formances on the football field and the basketball court. Breland called Davis a true champion who keeps living up to the pressure and praise heaped on him while continually overcoming the different schemes oppo­nents put in place to stop him. “A lot of times they didn’t even slow him, not for very long,” Breland said. Davis was named the North and East area football player of the year. He earned that honor largely because of his play-making ability at quarterback in the Colonels’ spread offense. Ironically, coach Demetrius Turner uses a similar scheme to get Davis going on the hardwood. Davis averaged 17.3 points, six rebounds, three assists and five steals per game. Turner said every game the player known to many as Bay-Bay would produce a play that would leave him shaking his head. It made him look good as a coach, he said, but acknowledged he couldn’t take credit for it. “That’s something he did, that’s God-given,” Turner said. Fairfield coach Jim Vakakes has gone on record with that comparison several times over the years he’s lost sleep gearing up his defenses to face Davis. That last quote comes from the glowing review of Davis offered by the News’s Jeff Sentell last fall, which you may remember, in which he claimed “there is not a single player in the Yellowhammer State more likely to make a man miss on a given play.” Give it a read. 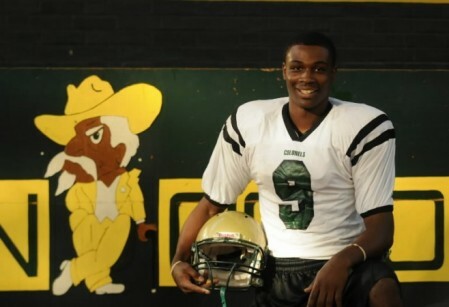 As for Davis’s recruitment, once Auburn offered–thanks to Breland’s Auburn ties–it was pretty much done with. I’ll tell you what Davis makes me think of: Demopolis, a few years back, when I was writing for the Demopolis paper and the Tigers were being quarterbacked by a kid named Dontrell Miller. Like Davis, Miller was undersized (sub-6 feet, less than 180 pounds), primarily an offensive player in high school despite projecting to the defensive secondary [in college], and while cat-quick wasn’t blessed with top-end sprinter’s speed. But it’s hard to describe exactly how eye-poppingly elusive Miller was: weaving 60-yard punt returns and epic 45-yard back-and-forth quarterback scrambles weren’t highlights for Miller, they were just about the norm. Given his remarkable combination of footwork, reflexes, and return skills, it was easy to envision Miller shining as a major-college defensive back and return specialist. And yet he never did snag a D-I offer and ended up at Tennessee-Martin … where he became the Skyhawks’ best defensive player and in 2008 was named an FCS All-American. Yes, it’s safe to say that these past two seasons, Auburn could have used a player like Miller. I have no doubt that Auburn is going to use Davis. Of all Auburn’s QB-turned-DB brigade, he’s the one with the most complete package for the secondary: the reflexes, the agility, the size (5’11” isn’t so bad at all for a corner), the stop-and-cut skills, the speed. It helps that corner’s not so crowded a position at Auburn this year, but it’s still not a surprise he’s already avoided scout team duty and could see the field a week from Saturday*. The upside is there in spades. All he needs is time. End result of that time: a nickel position next season, a solid shot at a starting job his junior year, and maybe some even bigger things down the road. *That said, I’m a little surprised Davis was eliminated from the punt return derby so quickly. His hands may need work, and after last year and with Darvin Adams still in the mix, I have no doubt that “hands” were the No. 1 qualification for a punt returner for Auburn in 2011. Maybe next year. You know, when Ole Miss had that big debacle over the mascot, they should have just changed it to that one. Win-win for both sides, right? That football highlight video is pretty awesome. Almost up there with Da-Da. That highlight real was AUsome. That catch at the 1:39 mark was unbelievable. I’m glad Chizik & the guys kept him in state. I’m also suprised he’s not in the punt return mix. He was my choice through the offseason to win the job. Coaches, however, can be cautious about putting freshmen back there. I still think he’s going to make some noise as a returner, maybe even before the years out. AO, totally. Someone should ask them.